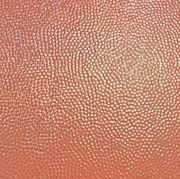 Hammered Copper Sheeting Thickness 22 mil (16 oz/24 gauge) Our premium textured/embossed copper sheets are a part of the Liberty Series. They are often used for bar tops, counter tops, table tops, range hoods, backsplashes, fireplace surrounds, wall paneling, fascias, various architectural applications, and much more. These sheets are malleable but also very durable and resistant to corrosion, scratching, and dents. They have an unsealed, shiny finish. They can be sealed with lacquer to preserve the shiny finish or left unsealed to develop a natural patina. You can also create your own patina using one of our patina solutions. If you don�t see the size you need, want to discuss your project, or have any other questions, please contact us via phone at 252-491-2812, email at info@basiccopper.com or try our "live chat" feature for immediate assistance! Hammered Copper Sheet-New York 12" x 24"
Hammered Copper Sheet-12" x 48"
Hammered Copper Sheet-New York 24" x 24"
Hammered Copper Sheet-New York 24" x 48"
Hammered Copper Sheet-New York 36" x 48"